Mack Maloney, born in Boston, Massachusetts, is the author of 40 sci-fi and adventure books. He graduated from Suffolk University in Boston with a degree in journalism and went on to graduate school at Emerson College earning a degree in filmmaking. 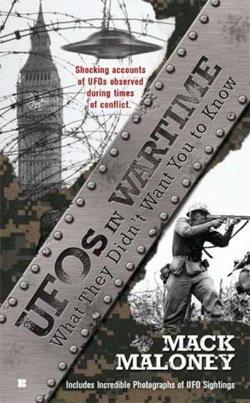 Mack joins us to talk about his new non-fiction book, UFOs in Wartime. UFOs are found in Renaissance art, on ancient coins, etched on cave walls-and reported in the Bible but Mack will talk about when they are documented most: in times of war. We'll discuss some of these sightings, who made them and how the crafts take sides. Some UFO sightings were also made at key points in history. Mack shares his personal theory about the appearances of these crafts. We also talk about strange sightings in history such as the ghost fliers and rockets, the foo fighters and UFO presence during the black plague of the middle ages.